The three matches I’ve fished in this league so far have been a real mixed bag and swapping and changing methods hasn’t helped. 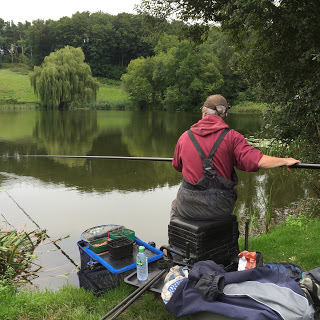 The feeder has been winning most of the matches but I’ve tried it a couple of times without much success, so today I was determined to just fish the pole. 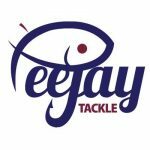 I got to the pub for the draw and there was yet another new face as Tackleuk’s Andy Downton was fishing today, Ashley Tomkins and Paul Homewood were also back so with all the regulars, there were fourteen fishing which is a good turnout. Rob announced the draw and I had the last peg in the hat which was peg 4, a great peg and one I’ve won off a couple of times. 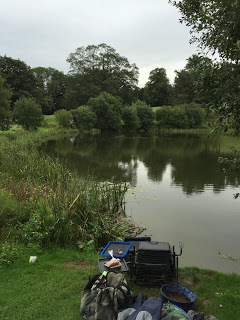 I got out the pond and it was flat calm much like the last match where I’d really struggled to catch shallow but this time I’d make sure I set a deep rig up. Fieldy was on my right in peg 2 and I had Stu Alford on my left in peg 6 which has been really consistent and Ash was next to him in peg 8. I mixed up some Bait-Tech Pro Nat Dark before setting my rigs up, a Preston Chianti for up in the water and a 0.5 gram Drennan Roach for my deep, both had size 18 B611’s to 0.10mm hooklengths. Bait was the usual casters, maggots and hemp. On the whistle I cupped in two balls of groundbait at 11.5 metres before starting over it with a single caster, I was feeding casters and hemp on this line and also by some lilies at the same distance angled to my right. I had a bite on the drop first chuck and was soon swinging in a small roach, in the first thirty minutes I had 18 fish, mainly roach, all caught on the drop and the fish were obviously up in the water. I decided to try the shallow rig and added another 17 fish to put me on 35 after an hour for probably 3lb or so and it was a decent start. If I could maintain that sort of catch rate it would give me around 16-18lb, probably not enough to win but it would put me in the money. I could see Ash catching shallow as well although Stu was struggling a bit on the feeder at this early stage. Going into the second hour I was still getting lots of bites shallow but missing loads of them (which seems to be the norm for me), I switched back to the deeper rig and the bait actually reached the bottom but then the float just sat there! Back on the shallow rig and I’d get a couple of fish including the odd better one but it was hard going, a look by the lilies was much the same, odd fish and loads of missed bites and by the end of hour two I’d only added another 17 fish and if I was going to do any good today, things needed to improve and fast. Me in ‘action’, although I use the term very loosely! Stu had a couple of skimmers but from what I could see it looked like Ash was only getting the odd fish shallow. Then it started chucking it down and after putting my coat on, I went back to catching very little. I thought maybe the cold rain might have pushed the fish down but I just couldn’t catch on my deep rig and then Stu slipped the net under a nice bream and with word on the grapevine that Big Frank had caught a couple of slabs plus some skimmers over on peg 20, I needed snookers already. Thankfully the rain eased up as we headed into the last period of the match, I just needed the float to start going under now! Scotty Russell turned up, fresh from his carping exploits in France and said he couldn’t believe the lack of indications I was getting, he said most people were struggling before walking round to see how Ash was doing. I added a couple more roach but to be honest I was looking forward to hearing the whistle. 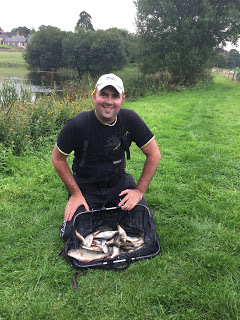 Ash had fed a long line and kept trying it throughout the match but up to now he hadn’t had much off it, Scott obviously brought him some luck as he struck into decent fish and shipped back very carefully before netting what I thought was a skimmer (but was actually a 12oz perch). I was getting some blows over the 11.5 metre line so went over it with the deep rig hoping a last gasp bonus might save the day and after five minutes or so, the float sailed away and I missed it! I went back out and after a short wait, the red float tip disappeared and this time I hit it but as elastic wasn’t streaming out the end of the pole I knew it would be a roach rather than the bream or skimmer I needed. I added a couple more roach before Rob signalled the end and my clicker showed my final tally as 85 fish which I knew would be no good today. 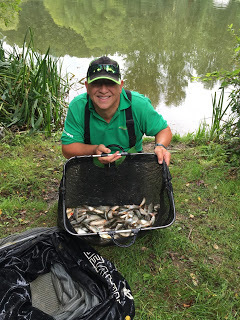 I packed up and walked down to watch the weigh in and get a few photos, I missed the first two in our section, Leighton had 6lb 5oz from peg 13 and Nick Payne had 3lb in peg 12. 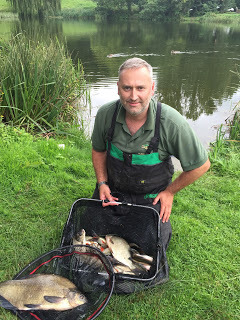 Bob had struggled for 1lb 4oz and then we got to Ash who weighed 9lb 12oz before Stu had a lovely net of bream and skimmers weighing 20lb 10oz and it would be between him and Frank to see who would be the first angler to win two matches this series. My fish weighed a disappointing 7lb 7oz and there would be no envelope for me this week, Fieldy was the last peg in our section and he had 260 fish for 11lb 9oz. We drove round the other side for the results and Frank was top in that section with 17lb 1oz, it was a case of deja vu for Steve Parker as he’d drawn the same peg as last match (14), weighed exactly the same weight as last time (8lb 2oz), won the section again and took another nugget off me. Rob didn’t weigh in peg 17, Jake had 3lb 15oz from peg 18 and Andy Downton had 7lb 8oz from peg 19. Paul Homewood had 5lb 12oz and paid me a pound to put me evens on the side bet front and then Hurf had 5lb 13oz but instead of giving me a nugget, he handed me 63p in shrapnel! So although the leading weights were good, most people struggled today and those big roach and rudd seem to have done a disappearing act. Even though the top two weights were caught on the feeder today, quite a few people have fished it and struggled so I’m none the wiser on how I’m going to fish the last one in two weeks time. Maybe if we get some more rain, it’ll put some colour in the pond and those bigger roach will feed again. So the three most consistent performers in the league filled the top three places again and going into the last match in two weeks time it’s very tight at the top, Fieldy leads with 10 points followed by Stu on 11 and Frank on 12. Then just to finish off a miserable day for me today, we were talking about when the river matches start, when Rob dropped the bombshell that he was only running one league on the river this year, so my match calendar now has rather a lot of empty spaces and I’ll need to find something else to do every other week. I’m seriously gutted, I was so looking forward to getting back on the river which fished brilliantly last year and now we’re only having a handful of matches on it. 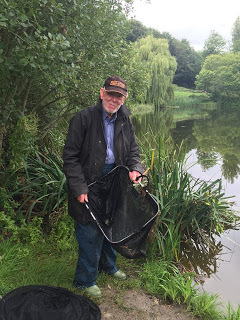 In fact if we get rained off a few times and end up out the pond, we might only get to fish it three or four times, what a waste. I’m in no way having a go at Rob who I think does a fantastic job and it must take up a lot of his time but I just think it’s a massive shame that we’ve got this cracking bit of river and we’re not going to use it, I’ve quite fancied spreading my wings and might look at fishing the Tone which is another cracking bit of water but shame my peg fees will now go into another clubs bank account when I’d much rather fish closer to home and support my club. I spend nearly every Saturday in the winter driving too and fro from the river to see which pegs are or are not fishable, whilst I’m looking at the river I also dig /cut out pegs for the benifit of all club anglers.So and as you said a lot of time and effort goes into ensuring that pegs are available for yours and other anglers pleasure on match day. Let’s talk about match day, royal oak series which is the one you are referring too. 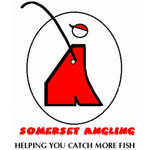 I get up at 0630 every Sunday to load my car with my gear but I also have to sort out peg numbers, scales etc for the match.The average turn out for this leauge last season was 5 and that’s including myself ,like yourself I love the river but this series is just not supported in the same way as the VES.The anglers that fish the winter series make a choice between the oak and the VES , they don’t fish both. There are 5 dates in the ticket for the royal oak series and despite this being a mistake in printing I am prepared to honour these 5 dates this season, if this is supported I will carry this through into the second half of the season, if not that’s it for this season. I can’t be any fairer than that so for all reading this spread the word if you want to keep it. So there you have it, lack of support, basically with the league it’s a case of use it or lose it….